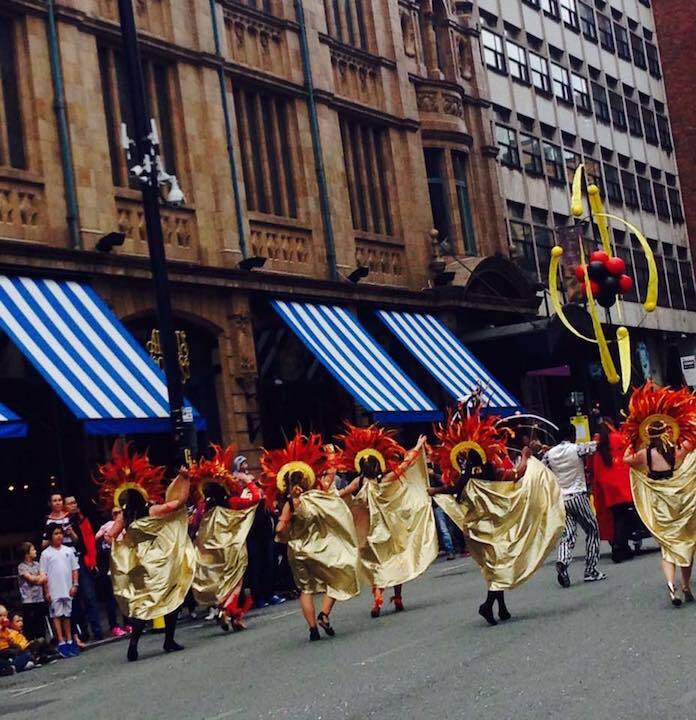 Welcome to Manchester School of Samba! 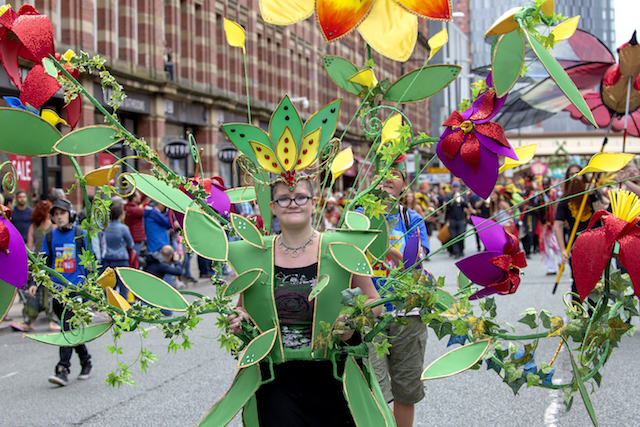 Manchester School of Samba (MSS) (click here for office contact details)., a fine, friendly bunch of people and the first Samba School in the NW of England, which formed in March 1995 to foster the appreciation of Brazilian Carnival culture through rhythm, melody, dance, puppetry and simple costumes. 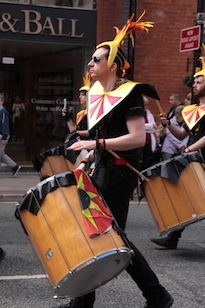 MSS have provided an often life enhancing introduction to percussion and dance for hundreds of people as well as an opportunity for some to make new friends, build on their knowledge and strengths, be inspired and subsequently make it part of their life. 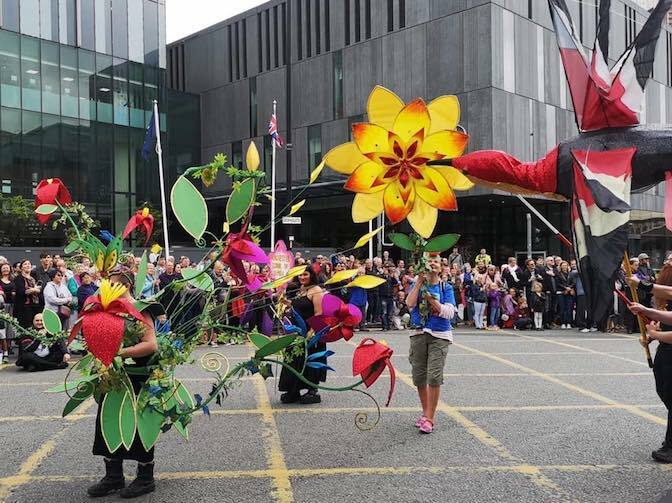 We currently have 50+ fully fledged members including dancers and drummers, and for special occasions also like to recruit a brass section and puppeteers. 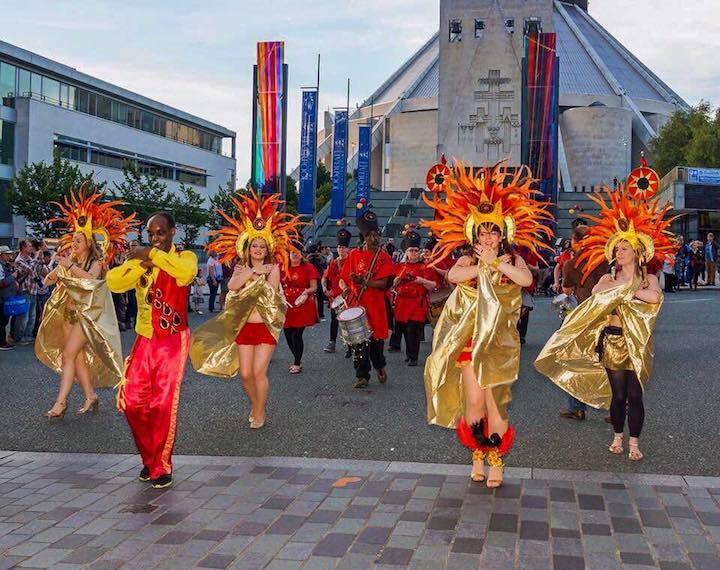 We focus on Brazilian Carnival Art forms, and teach rhythms & dances from different parts of Brazil at all levels from beginners to advanced and are open to all people. Scroll down this page for more information including pictures and even more videos!. Hello and a warm welcome to anyone who has just encountered MSS! 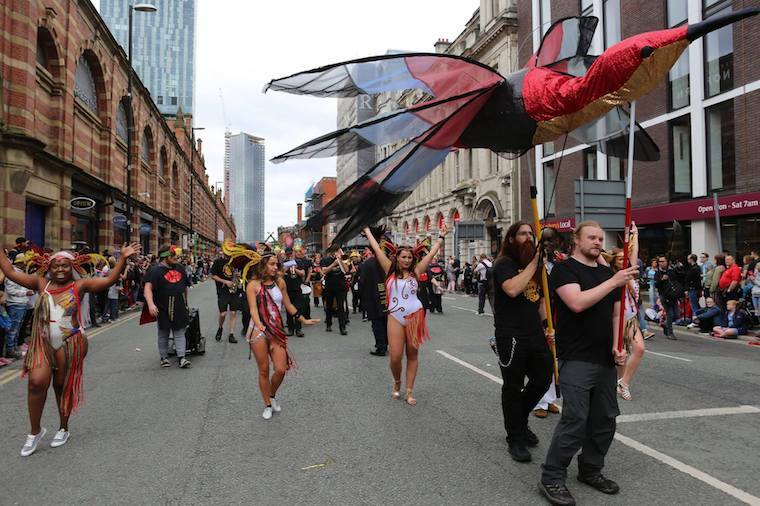 We look primarily for those who wish to become our new players and dancers and perform at future events (especially The Manchester Day Parade and Brazilica), but there are some who attend our main rehearsal regularly just for the fun of it! We hope you come along on a Wednesday, like what you see, and consider joining us. 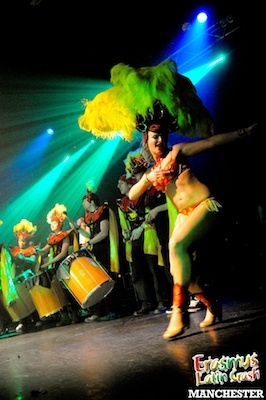 We always need new people, and are currently continuing our training program for 2019, including new or updated versions of Afoxe, Samba, Samba-Reggae and Congada, and this coming week we will return to some of these, as well as extending our Maracatu focusing on the groove, and further enhancing each rhythm. 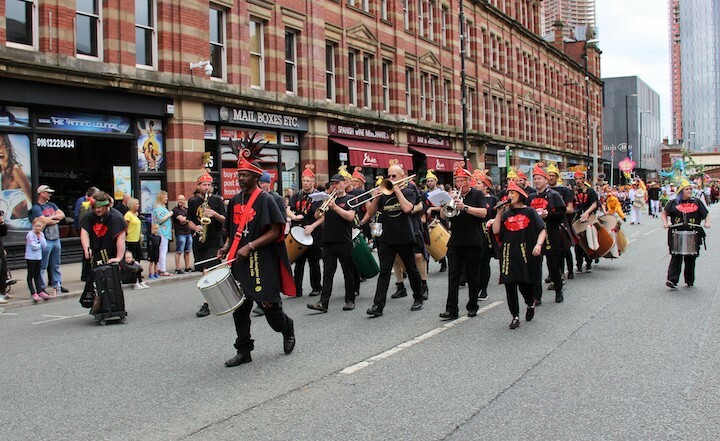 Once we have consolidated these we will look at further traditions over the following weeks, using dance and percussion, until we have all the main ones covered! If you think this could include you, join other new people on Wednesday 24th April 2019 and thereafter to explore with us! To find us on a Wednesday make your way down to our rehearsal space, Sacred Trinity Church near Deansgate (situated behind the traffic lights on the junction of Chapel St and Blackfriars Rd, - an easy walk from Piccadilly - just continue down Market Street/St Mary's Gate and straight on over Deansgate, until the route crosses the Irwell into Salford over the bridge that is Blackfriars Street, and you'll see the Church between the railway viaduct and Chapel Street, behind and slightly to the left of the lights), for 7.00p.m. and join the rehearsal (brief pause around 8.30, 9.30p.m. finish). If you are in a car there's free on street parking on Chapel Street! We are open to participants of all levels of ability and you can join at any time throughout the year. 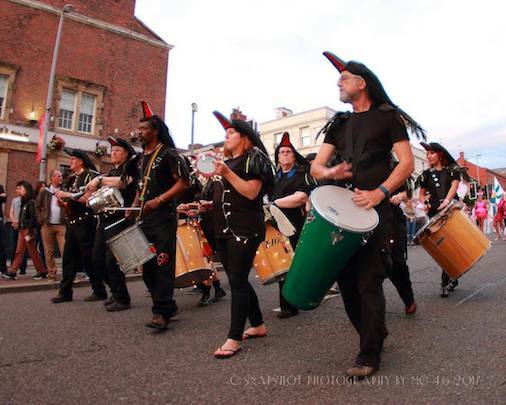 We provide all necessary percussion and a dance space, to any potential enthusiast over the age of 16 (children can come under the supervision of their parent or guardian) and is very affordable at UKP 6/5.50 per session to non members! If you just fancy an exciting way to work out or want to become one of our dancers and perform as part of MSS, then by all means come along! 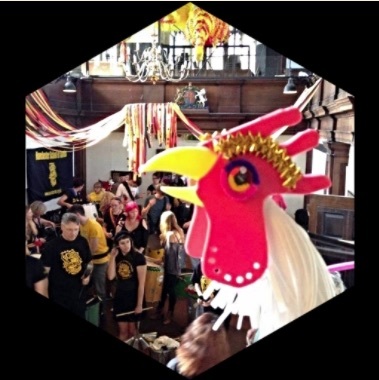 The dance class is part of one and the same class in our rehearsal space, in Sacred Trinity Church , helping to make sense of the rhythms the drummers play, and an integral part of each and every Wednesday night rehearsal but currently we need more dancers! When you come along Danny (at the front in the picture above) will soon have you up to speed! We provide a dance space to any potential enthusiast over the age of 16 (children can come under the supervision of their parent or guardian), and each session is very affordable at UKP 6/5.50 per session to non members. 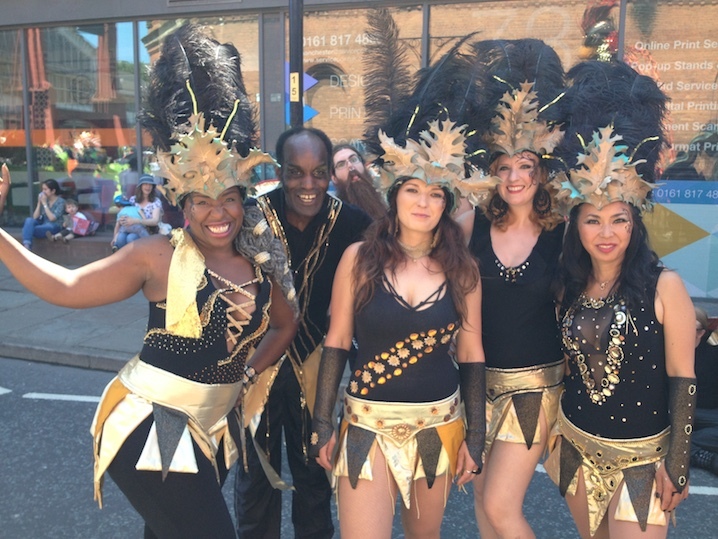 We always need new people, and Danny runs a continuous training program to show you the moves from each regional Carnival tradition matching each rhythm. If you want to learn, simply come down, your next chance being Wednesday 24th April 2019! (See the box " Can I Play" above for walking directions). Storming_vimeo from true story digital on Vimeo. Keep an eye on this box for details of some of our public performances. For some see "News" below. Playing outside Cosmo Restaurant for their official opening event! 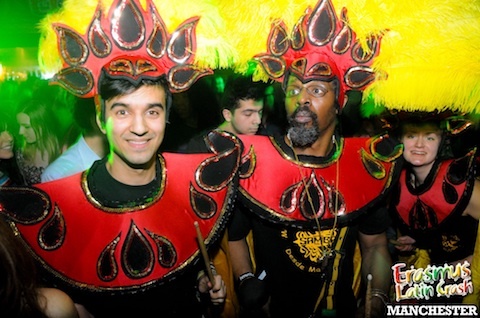 Some headdresses we custom made for Haribo. This is us in 2013.